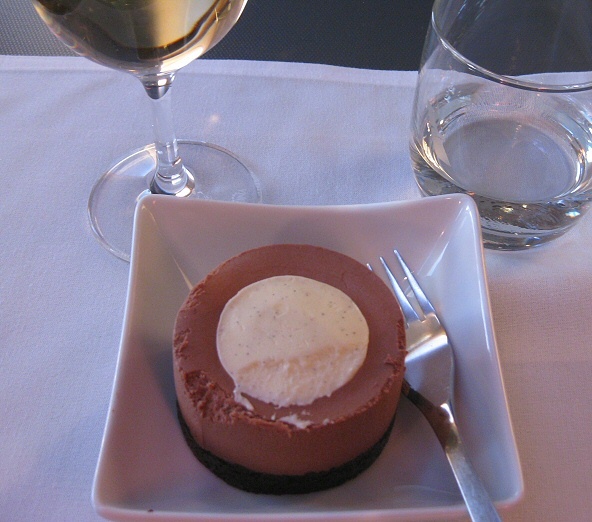 This post is part of a series reviewing our 2015 Anniversary trip to Europe. For a full list of the posts in this series, and for an overview of the trip, check out the index page. Our entire itinerary was planned around this flight, the showpiece of the whole “surprise Nicoleen” plan. I had actually wanted to book us business class seats (50k miles one-way) on the same flight but none were available at the saver award level for the entire summer. First class saver seats were only 12.5k miles more however, and I wanted access to the 777-300ER’s premium class stand-up snack bar, so I searched for first class saver seats. There were only a few saver level first class seats available, and only one date had a pair of seats. Luckily that date worked within our other constraints, so I booked them (62k miles one-way, each). Having been delayed on our ORD-JFK flight, we only had an hour to spare at JFK before boarding began for our transatlantic flight to London-Heathrow (LHF). While Nicoleen would have been happy to stop by the Admiral’s Club for a beverage, I was determined to see both lounges we had access to, American’s Flagship Lounge and Admiral’s Club. At JFK both American Airlines lounges share a lobby area in Terminal 8. An elevator takes you from the concourse up to the lobby where the staff at the desk check your privilege and point you toward whichever lounge you have access to. 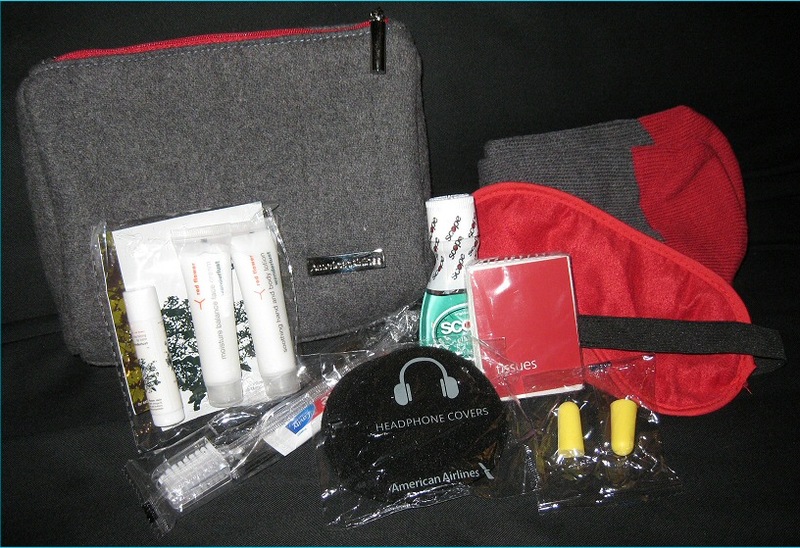 (Click here to go to American Airlines’ page on lounge access requirements.) We were waived through to the Flagship lounge and politely reminded that we didn’t have much time before boarding would begin. The JFK Flagship Lounge struck me as long and narrow. It has a nice big window along one entire side, looking out over the tarmacs and runway. My visit was brief so I didn’t get to explore every nook and cranny, nor take advantage of all the amenities. The JFK Flagship Lounge was much more crowded than our experience at the Chicago O’Hare Flagship Lounge, but this very well could have been due to the time of day more than anything. The food seemed more picked over and old as well, but not deplorable by any means. I made a small snack of chicken, cheese, and olives, grabbed a beer, and scarfed it down while Nicoleen watched. She was worried about making the flight, so she went ahead of me to board. After my quick snack I took a walk through the Admiral’s club and found it to be even more crowded than the Flagship Lounge. During my quick walk-through I saw no noticeable differences from the Admiral’s Club we walked through at ORD. After my brief snack at the Flagship Lounge I had to scurry down to the gate for boarding. By the time I got there nearly everyone had boarded. I don’t personally put much value in early boarding; I have a back issue that makes sitting painful so for me the more time spent upright, the better. I was warmly welcomed by the attendant and shown to my seat, 1A, where I found Nicoleen settling in across from me in 1D. Seconds after sitting down I was handed a bottle of water and offered champagne, which I accepted. The purser offered us a choice of several newspapers and quickly moved onto getting our meal orders. As I have previously stated, I’m not much of a wine connoisseur but I do enjoy good wine (in much the same way as a dog “appreciates” a good steak – he doesn’t quite understand why it’s good, but he still likes it). With some guidance I chose one of the whites and was not disappointed. After knowing about this trip for months and having the meal choices available online for over 30 days, you’d think I should have been able to order quickly. As it happened, I think I was still debating the food options after Nicoleen had ordered. 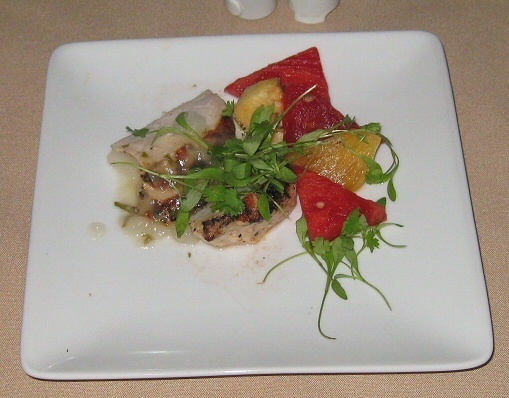 I settled on the Thai chicken starter, creamy carrot soup, the salad of mixed greens with artichokes and feta, the seared halibut with gremolata, and the royale chocolate mousse cake for dessert. I should have probably skipped the snack at the Flagship Lounge because I was fairly well full by the time the fish came, but oh well; I’m a sucker for free food! Overall the food was pretty good. The Thai chicken and salad were excellent, and the soup was interesting (unexpectedly spicy! 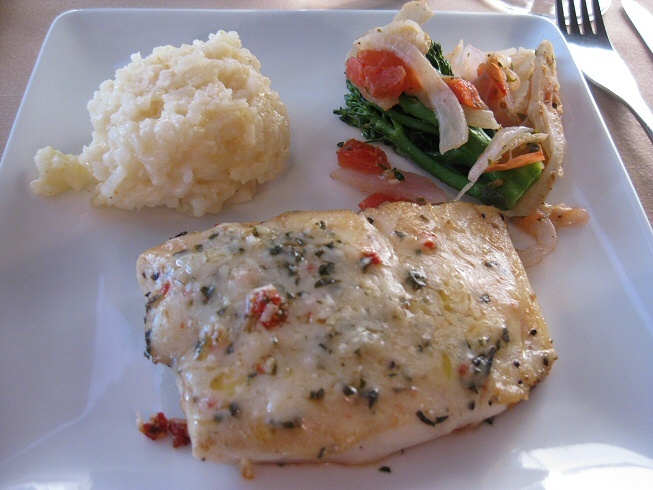 ), but the fish was a bit dry and rubbery and the seasoning was nothing to write home about. 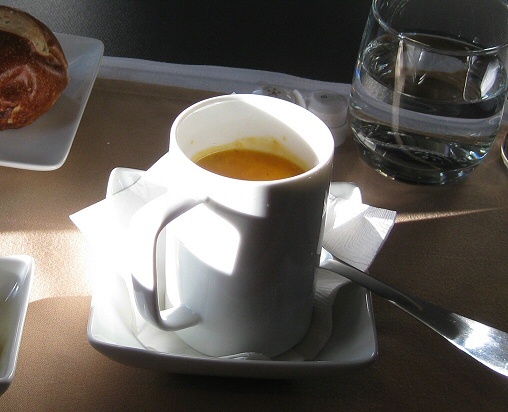 The presentation was good but I found a piece of dried on food stuck to a piece of silverware…not something you’d expect to find in a first class service. A cool feature of this first class cabin is that the footrest doubles as a jump seat, complete with seat belt, so that you can dine across from your traveling companion. The tray table is deep enough for two place settings. We weren’t planning on doing this however, due to Nicoleen’s baby belly. She was plenty happy to enjoy all the room her own seat afforded her! The purser never mentioned this as a possibility though, which was the start of a series of not being shown or offered many of the amenities this flight had available. Side note: One of the biggest “problems” about flying in these cool lie-flat first and business cabins is properly splitting your time between sleeping, which is actually possible with these seats; and enjoying all the other entertainment, eating, and drinking options. I would have loved to have milled around at the stand-up snack bar or ordered some beers and watched a movie (in comfort, for once!). 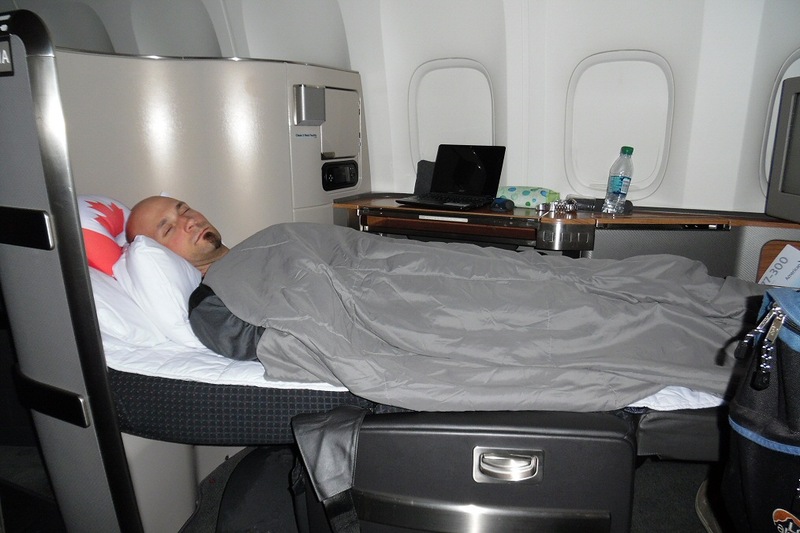 On the other hand, I had a rare opportunity to get some real, quality sleep on a flight due to the lie-flat seat. It was tough to divide the time. This conundrum brings to mind some valuetactics wisdom: The value of paying extra (miles or dollars) for premium cabins, especially with lie-flat seats, vastly increases as the length of the flight increases. After a while I started wondering about the stand-up stack bar I was enamored with, and was part of the reason I wanted to fly on this aircraft. 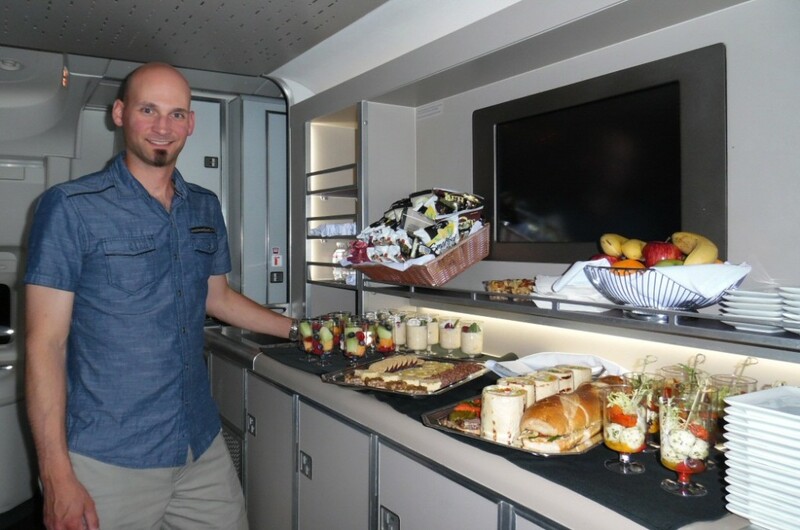 It is located between the first and business class cabins, and when I went to check if it was operational I found the flight attendants assembling the snacks. I was told that it was almost ready but that I didn’t have to use the lowly business class area; I could go to the first class galley for the first-class only version (which I had not read anything about). So I went up in front of first class and found the purser and another attendant putting the finishing touches on the snacks there. After checking out the snack bars I decided I’d better get a few hours sleep on this overnight flight. 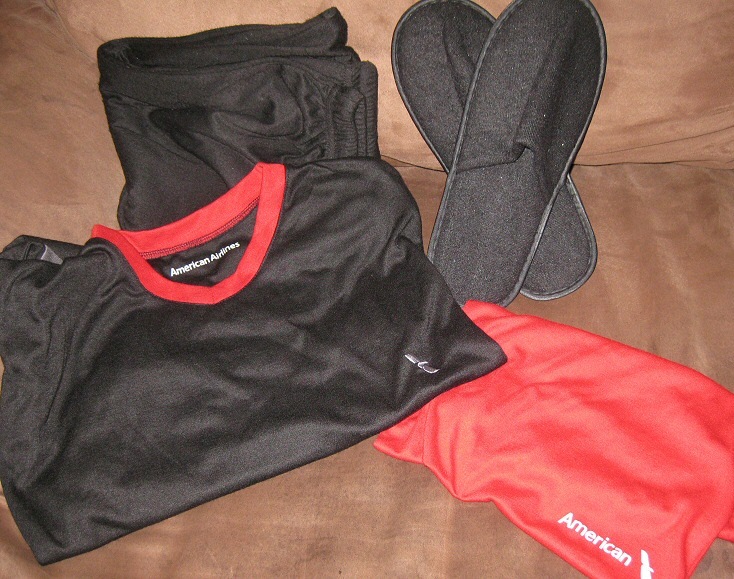 I was surprised we hadn’t been offered pajamas or slippers yet and I was worried that maybe American Airlines had dis-included them as part of the first class service. I asked the purser about them and he reacted as if his memory had just been jogged. He quickly produced a set of jammies for me and asked what size Nicoleen would prefer. She was already dozing off so I told him I wasn’t sure, and he gave me two sets in different sizes and told me to just give her both to keep! At this time the purser seemed to remember that turn down service was supposed to be included too, and offered to do so as I changed into the pajamas in the bathroom. None of the other 6 passengers in first class received pajamas or slippers to my knowledge. Yes, it’s totally staged. I had just crawled into bed and was not sleeping. Upon waking we were offered a small breakfast, which we both declined. It was a rude awakening after only 3 hours of sleep or so, and the remainder of my flight was spent gathering up all my strewn-about belongings to prepare for landing at EuroAirport (MLH). 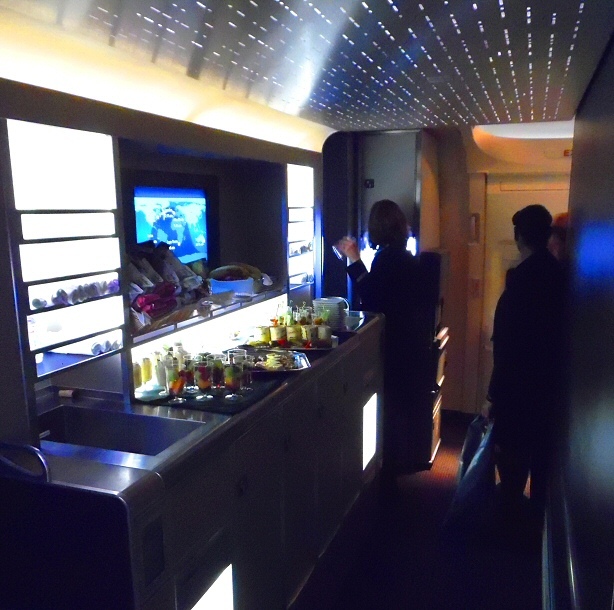 I don’t know if it was just this particular purser, crew, or just an off day for American’s service, but I finally understood why many other bloggers and reviewers talk about how American carriers are just not up to par on service in their premium cabins. Among all the stages in our first class itinerary (the American Flagship Lounge at ORD, the Flagship Lounge at JFK, both domestic first class flights, the 1st class JFK-LHR flight, the Galleries Lounge at LHR, and the BA flight to MLH), we felt like the lowest experience to expectations ratio was on this transatlantic long-haul flight. 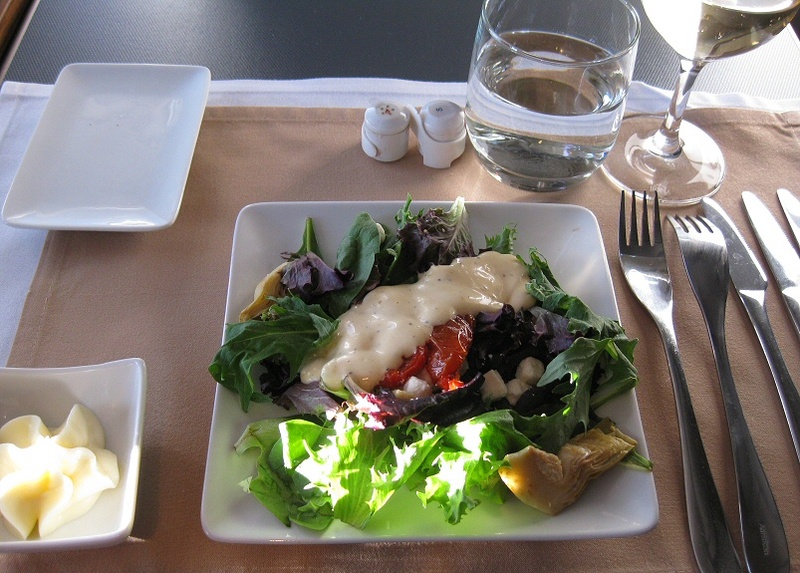 The service was by no means horrible, but neither was it exceptional…which it should be on an international first class flight. I’ll never complain about flying first class for virtually no cost, but had I paid the full retail $9,821 for this booking, I would have justifiably felt a bit ripped off. As they say the hard product delivered, but the soft product fell short. This entry was posted in American Airlines, Flight Reviews, Lounge Reviews, Trip Reports, Wisdom and tagged Anniversary Trip 2015 on December 1, 2015 by Gomanson.